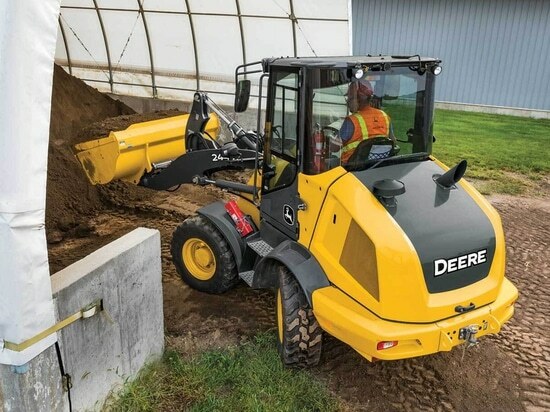 John Deere’s new 244L and 324L compact wheel loaders come with a boost in speed, better maneuverability and a redesigned cab, the company says. The loaders come equipped with Deere’s Articulation Plus steering system, combining an articulating frame and rear-wheel steer. 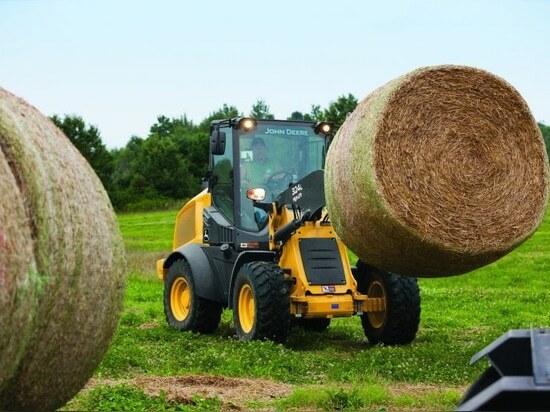 Deere says the system makes the loaders ideal for tight spaces. It also adds stability and lifting power in tight turns. Deere increased speed 21 percent over the 244K and 324K, which the L-Series models replace. 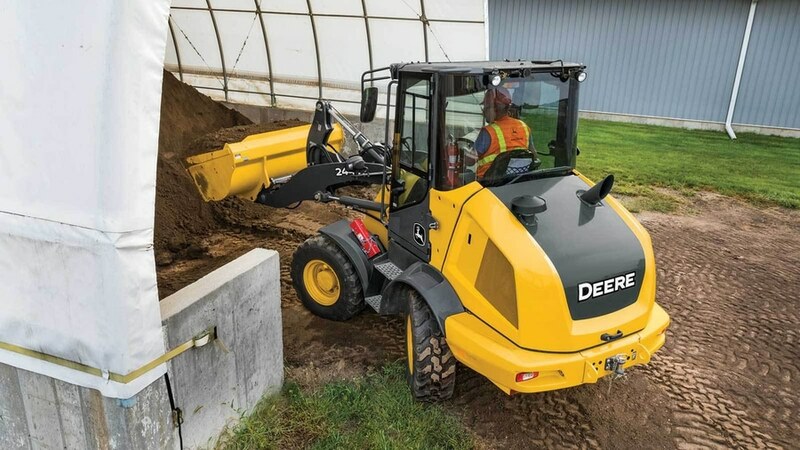 The loaders can now reach 23 mph, and, thanks to a new auto-shift hydrostatic transmission, operators don’t have to manually shift gears to reach higher speeds. 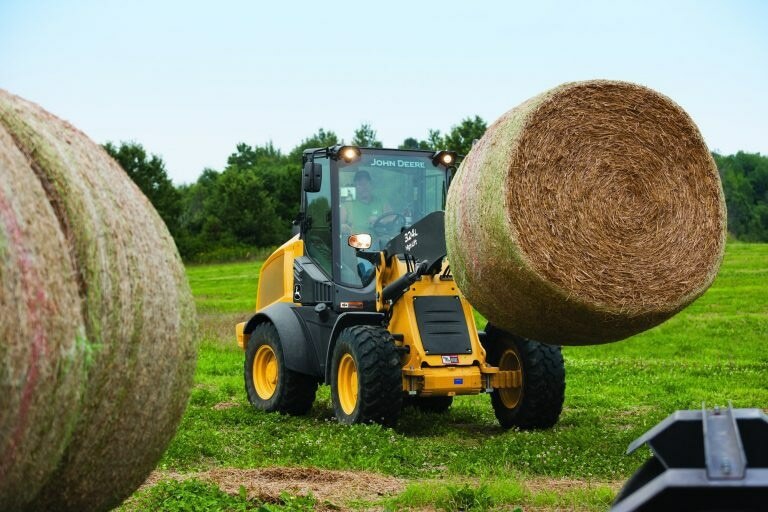 Both loaders are powered by 73-horsepower Tier 4 Final engines.Operators will find a redesigned cab with better visibility to the loader arm and bucket and a switch and gauge layout designed to increase efficiency, Deere says. An air ride, high-back seat is optional. The company says the machines’ new linkage improves parallel lifting with only 6 degrees of rollback. Full-lift dump height for the 244L is 8 feet, 3 inches with a full-turn tip load of 8,157 pounds. The 324L with high lift reaches 10 feet, 3 inches high. The standard 324L has a full-turn top load of 9,766 pounds. The 244L has an operating weight of 12,258 pounds and a bucket capacity of 1 cubic yard. The 324L weighs 12,778 pounds and has a bucket capacity of 1.4 cubic yards. Other features include a right enclosure for better debris management, a revamped cooling package and a rim pull control that allows operators to adjust torque to job conditions. JDLink telematics is optional.